I am sitting at a desk invigilating the exams at the school and detoxing at the same time. What that means is that I have a headache, I am tired and a bit antsy. I started this cleanse on Tuesday, thinking I would be past the headache stage by Friday but my body had plans of its own. That is the good and the bad news about cleansing – you never know what is going to happen or when but in this case, at least something happened and that is a good thing. However, I have to say, that I am quite pleased with my cleanse. I did not listen to anyone. I am not following a plan from the internet or a book. I am doing a cleanse of my own design. Why? It is the only way to make it tolerable and make sure it fits my lifestyle. More importantly, no one knows what is right for me so I am listening to my body and choosing the foods and method that are best for me. You can do this, too. There are two issues I have always had when doing a food-based detox. It does not matter if this is a juice fast (and I did one where I had six juices a day) or a smoothie cleanse or just eating fresh fruits and veggies all day (which is the one that has always worked the best for me). I have also done water fasts before I knew better. The first issue is that I get very hungry to the point where time stands still and three or four days seems like three years. I also have a mild case of gastritis and if I am too hungry, I bloat. The second issue is that I often feel a little weak after a couple of days, which makes it difficult to do all I have to do during the day. Now most experts would suggest that taking it easy is better and to plan the cleanse for days when you are not working. I have found that does not work for me as being busy allows the time to pass more quickly. More importantly, I cannot think of a worse way to spend my time off. Free time is for fun and that includes eating things I want to eat. So How Do You Design A Cleanse For You? Whatever you eat must be raw as raw foods contain the enzymes needed to help you digest them. This saves work and energy for the digestive system especially the pancreas. Since 40% of your calories for the day go towards digestion, the energy save can be used for something else like helping the liver move out stored toxins from the fat cells. Be sure to include liver-friendly foods, fermented foods and prebiotic foods and choose foods you like to eat as much as possible. The foods must contain nutrients – vitamins, minerals, phytonutrients – as this is what the liver needs for Phase I and Phase II liver detoxification, the process the liver uses to prepares toxins for leaving the body. Nutrients are also needed for bile production, the “carrier pidgeon” that the toxins jump a ride with to leave the liver and the body. And finally, and this is where a lot of cleanses fail. A good cleanse needs to include fibre, especially prebiotic fibre to feed the good bacteria to make sure the bowels move and the toxins leave. This is why I am not a fan of juice cleanses, especially if the person is prone to constipation. Some type of fermented food is also necessary to aid elimination. Good bacteria plays a supportive role to the liver and helps control inflammation which can be exacerbated during a cleanse. How Did My Designer Cleanse Work? Very well. I started on a Tuesday and all was going well – no headache or extreme fatigue – just felt a little antsy. Then as bedtime approached my neck got really stiff and it felt like I had a huge lump in throat, making it feel uncomfortable to swallow. This is a new reaction for me. I was also quite stiff overall. On day two, the throat felt a little better, the neck was still stiff and so was I. The headache started that night. Day three the headache was full-on but the throat was almost normal and the stiffness was gone. Day four the headache is less today but still there and should be gone by tomorrow. This is my last day. Detox reactions are almost always going to include headache and fatigue. However, other reactions are going to be what you already experience. So if you have acne, you may breakout. If you are prone to stiffness (like me), you will be even stiffer. I have lymphatic issues so I suspect that was the cause of the throat reaction or it may have been my thyroid reacting. I do not have any tonsils so that area for me is a problem. What Did I Consider For My Cleanse? I originally was just going to do fruits throughout the day and a super green smoothie to get more nutrients. But I knew I would fall off by day two because I would be too hungry and the green smoothie would make me gag by the second day, no matter what I put in it to try and make it tasty. I also wanted to be able to chew my food as that helps with satiety so I knew my cleanse must contain whole foods. The most important consideration, for me, was to make sure I was not too hungry so I would not bloat. I wanted a cross-section of vitamins, minerals and phytonutrients to support the detoxification process. I also wanted to make sure I had plenty of fibre and support for my good bacteria levels with prebiotic and probiotic foods. Having plenty of carbs for energy and some protein was also a consideration as was having some fat as my hair and skin did not like previous fat-free cleanses. Again, all these must be raw. And finally, I had to like, for the most part the foods, I was eating. All ingredients are organic to minimize any new toxins entering into the body. No supplements were allowed (unless absolutely necessary and it wasn’t). Plenty of clean water like spring water (with minerals) throughout the day. No reverse osmosis water unless re-mineralized and no distilled water. Why? Lemons contain limonene, a phytonutrients that supports phase I and II liver detoxification. Ginger has been shown to help alleviate liver damage. We can never truly understand how mean we are to our livers, the nicest and hardest working organ in the body, and a little love and repair goes a long way. 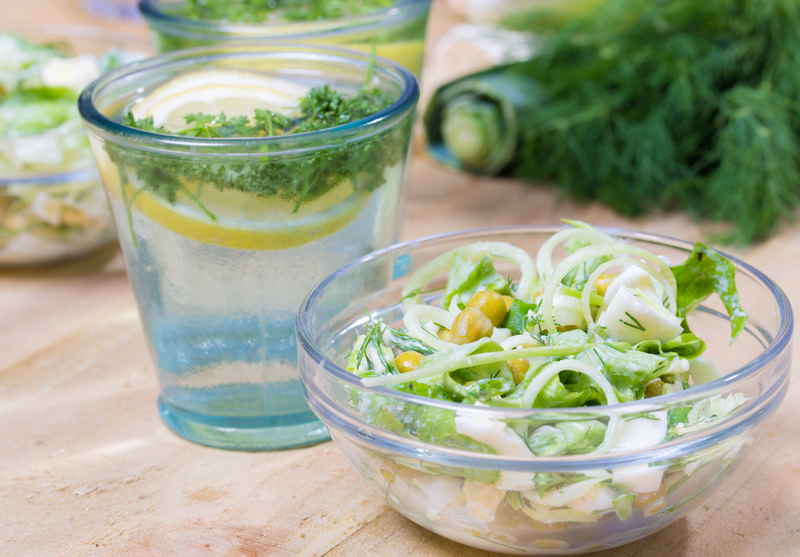 The water helps fill the stomach, hydrate the body and flush out the toxins. If parsley is added, it provides a lot of chlorophyll which aids detoxification. 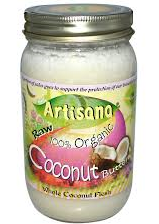 1 tablespoon raw coconut oil melted in 4 ounces (112 ml) warm water. Why? The coconut oil helps support the thyroid, metabolism and converts easily to energy. It also helps blood sugar and increase the feeling of satiety. Coconut oil is also good for healing the digestive and intestinal tract and will help with my gastritis.The honey contains 10 strains of good bacteria and helps keep blood sugar stable as does the cinnamon and the coconut oil. Cinnamon and turmeric are both anti-inflammatories which will help with some of the symptoms of detox and turmeric is also good for the liver as it can help with repairing the liver and aid with detoxification. Most fruits just makes me hungry except for the bananas which I always include in a cleanse. They also contain prebiotic inulin fibre. The extra piece of fruit is in case it is needed to satiate hunger or it can be a snack later. Remember that the liver needs energy to remove toxins and so do you in order to function throughout the day so do not skip the carbs. Why: Because it was the easiest to take with me to work and gave me the best feeling of having food in my stomach. The banana has already been discussed. Coconut butter, also known as coconut manna from Nutiva, is a combination of the coconut oil and the coconut meat, which contains more prebiotic fibre and actually tastes like coconut. Why? Because I can and they are yummy and they contain lots of lycopene, an anti-inflammatory that helps protect the liver and stabilize its function. Why? Lots of green chlorophyl in the lettuce and baby greens which is helpful for “cleansing” the blood as it aids detoxification by adding oxygen to the blood. The greens contain a few that are “bitter” which stimulates bile production. The orange is a personal thing – I like the taste of it but it also contains limonene (less than a lemon) and d-glucorate (less than a grapefruit or apple) and both aid liver detoxification. The aged raw milk cheddar contains essential fatty acids (EFAs) which the liver also needs, other beneficial fatty acids, some protein and good bacteria which can help both liver and intestinal function. It is also the cheese that provides a feeling of satiety. The carrot is a another good source of lycopene and other anti-oxidants that can protect the liver, especially when consumed with fats which aid the conversion of the beta carotene to the form of Vitamin A we need as humans. Cucumber contain a number of compounds that help the liver remove toxins and they, like lettuce, are loaded with water for hydration and aiding the flushing of toxins. And finally, the onions are both liver-friendly and a prebiotic for the intestinal good bacteria. As for the dressing, the apple cider vinegar is another fermented food. It contains malic acid (which helps prevent gallstones and can aid in their breakdown) and d’glucorate, which are both good for the liver. The olive oil is helpful for both liver and gall bladder health. Dill helps eliminate toxins from the liver and helps with gas and digestive disturbances. Mustard seed powder helps with liver stagnancy and is also a digestive aid. Garlic, like onions, is also liver-friendly and a prebiotic food. Black pepper aids the absorption of nutrients that the body needs for detoxing and Himalayan sea salt provides valuable trace minerals which are necessary for good liver function. Broccoli, cabbage, cauliflower, horseradish, beets, kale (since it will be raw – rub the dressing into it to make it soft), zucchini, chard, spirulina, chlorella, Jerusalem artichokes, raw milk (if you have access), ground chia seeds, soaked nuts, and freeze-dried superfoods like moringa, cama camu, acai, goji berry or goldenberries. Avoid sprouts (that is another conversation for another day). There so many foods – choose what suits you. One Final Tip: Plan your cheat, if you know that you are prone to falling off. Pick something to have on hand or to take with you to work, just in case. I chose these really awful raw bars. They were made with nuts and fruits and had no flavour but at least they did not have a bad aftertaste. So I had them on hand just in case. Maybe you like chocolate so have some raw cacao nibs on hand. The last thing you want to be doing is hunting through the house or being tempted by something that is not allowed, just because you are too hungry. If you would like to continue to support the liver and maintain what you have achieved, pick the elements you liked in your cleanse and continue to do them. Many of these foods have the same benefits for the liver when they are cooked. Remember, the foods were only raw to create more energy for faster detoxing. Slower detoxing every day is the best way to keep the liver healthy on a daily basis. So some raw food plus cooked food will probably be best for you and for your liver.